After capping off 2015 with 31 successful years of teaching in the world of Yoga, on November 2nd, 2016 Prashant Yogashraya, Bangalore, celebrated the official opening of their Ramanagara center, 64 kilometers from Bangalore. 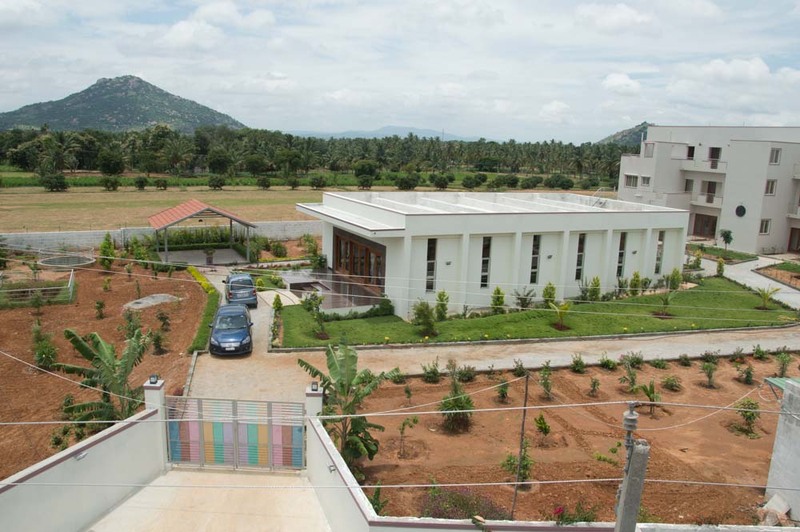 The Prashanth Yogashraya Ramanagara Center has been the dream child of the founders - Shri H.S. Arun and his wife Shreematha. PYRC, as it is popularly called is in the perfect spot. The hilly landscape and the wide open spaces of relatively untouched nature makes Ramanagara a beautiful escape from the hustle and bustle of the concrete jungle we live in. The center has a beautiful Yoga hall for 100 + students to practice. The hall boasts of large windows & glass doors that provide a great view of the majestic mountains behind with cool breeze through the day. It also has a two-storey building with 18 rooms that can accommodate upto 40 students, a large kitchen with a dining hall, a gazebo and soon to come will be an organic vegetable garden with lots of fruit trees around. PYRC is a Health and Education Center dedicated to the practice of Yoga imparted through H.S. Arun: Guru/Master/Teacher/Sir or simply called as Arunji. His vision is to provide as many people as possible a path to a healthier lifestyle through yoga and this vision is unified by a commitment to high-quality teaching and respect for each student's requirement. For the past seven years, Yoga practitioners local and abroad have come to Bangalore to celebrate the annual Prashant Yogashraya Yoga festival and longed for a place of their own. Their dreams, generous monetary support and dedication for Yoga blossomed and gave rise to the new center. PYRC is working towards organizing the International Yoga Festival workshop annually apart from many interim programs through the year. For 2017, workshops will be held for a week in February, July and October for seekers of health and education.Besides enjoying intensive yoga sessions, participants will also get to appreciate talks and knowledge sharing sessions by Ayurvedic doctors, Naturopathy practitioners and philosophers.